Anyone who has eaten a fresh cranberry knows that these native North American fruits have a unique taste. They also have some unique nutritional benefits. Cranberry procyanidins appear to inhibit the stickiness of bacteria, giving the tart red fruit—and its more popular juice—the ability to help prevent urinary tract infections. That same anti-adhesion property gives cranberries a role in preventing tooth decay, and possibly even the bacterial infection implicated in many stomach ulcers. Cranberries have one of the highest ORAC levels among the 277 foods tested by the USDA. They also provide vitamin C.
Cranberries are relatively low in sugar and carbohydrate—another thing anyone who has tasted them fresh might have guessed. That means that cranberries and cranberry juice can bring the benefits of fruit to those who must limit carbohydrate and sugar. 1. Bring the raisins, cherries, cranberries, orange juice and water to the boil. 2. Simmer for about ten minutes or until some of the cranberries start to burst open. Some will burst open and some will not. This gives a great texture. 3. Now add in the agave nectar, ginger juice, orange zest and cinnamon and simmer for a few more minutes just to allow the flavors to infuse. 4. Remove from the heat and allow to cool completely. 5. Chill in the fridge for at least a few hours to allow the sauce to thicken and the flavors to infuse. 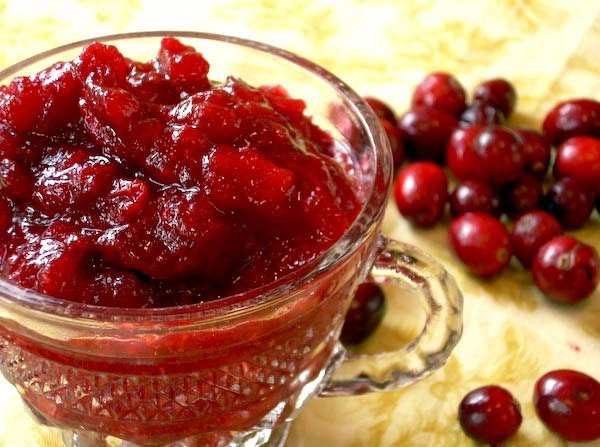 Cranberry citrus relish is a traditional North American cranberry recipe, and a common accompaniment to the Thanksgiving turkey. This relish is also great on a roast turkey sandwich! 1. Put the cranberries and orange sections into a food processor or blender jar. Chop coarsely, but don’t puree. Transfer the relish to a glass or ceramic bowl (metal can discolor the relish). 3. Variation. If you are serving this relish as a side dish, you may want to garnish it with a few bright curls of orange zest. Watch instructional videos from the experts on how to prepare those cranberry recipes quick and easily. Oxalates are a family of substances that bind with metals and minerals such as calcium, magnesium, and iron to form crystals in the body—sometimes in the form of kidney stones. Although oxalates are present in many foods, including most berries and nuts, cranberries are among the few with a very high concentration (rhubarb is another). Healthy people usually have no problem eating these foods in moderation, but cranberries and other foods high in oxalates can cause problems for those with kidney disease, gout, or rheumatoid arthritis. Because cranberries grow mainly in relatively cold climates where the growing season is short, they are available fresh only for a few months each year, in the autumn. Their role in traditional Thanksgiving and Christmas meals dates to the time before refrigeration when this was the only time of year to get them—and when they provided a late-season berry in regions that would have limited fresh produce until spring. Their timing may explain their wide acceptance (for they are a popular holiday food in Europe, as well as in the United States and Canada) in spite of their extremely tart taste. For a treat that’s less astringent, use fresh cranberries in combination with sweeter fruits such as oranges, apples, pineapple, or pears. 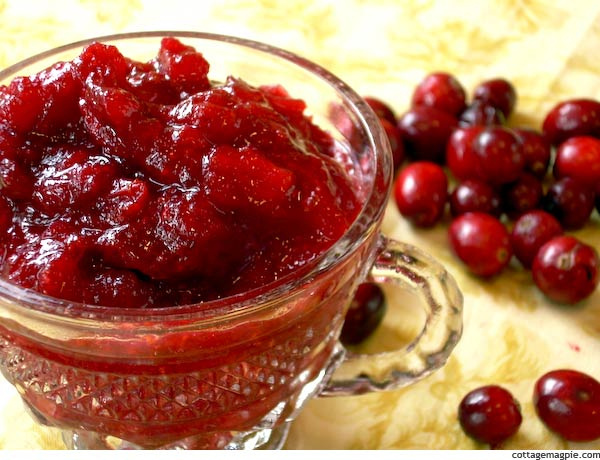 If desired, add a little fruit juice, agave nectar, honey, or maple syrup to chopped fresh cranberries. Since they are only available fresh for a short time each year, cranberries have long been available canned, frozen, and dried, as well as in juices, where they are often mixed with sweeter fruits for a more palatable taste. Try to choose cranberry drinks without added sugar. You can also dilute unsweetened 100 percent cranberry juice with sparkling water for a refreshing beverage with a little less bite. Cranberry procyanidins appear to inhibit the stickiness of bacteria. This anti-adhesion property helps in the prevention of infections such as those implicated in stomach ulcers and the urinary tract. It also gives cranberries a role in preventing tooth decay. Cranberries provide vitamin C and have one of the highest ORAC levels among the 277 foods tested by the USDA. Dried cranberries provide many of the same benefits as fresh ones, and at least one study suggests they could even be as effective as cranberry juice in preventing urinary tract infections! Because cranberries grow mainly in relatively cold climates where the growing season is short, they are available fresh only for a few months each year, in the autumn. Since they are only available fresh for a short time each year, cranberries have long been available in other forms, such as dried. Dried cranberries are so tart that it may be impossible to find unsweetened ones—and hard to enjoy them if you find them! Do choose dried cranberries that are unsulfured. Add them to salads, or brighten up wild or brown rice with dried cranberries and slivered almonds or pine nuts. 2. Rinse each piece of chicken well and pat dry with a paper towel. Place the chicken in a 9″ × 13″ glass casserole dish. Pour ½ cup of the orange juice over the chicken. 3. In a small prep bowl, mix together the paprika, garlic powder, onion powder, and lemon pepper. Sprinkle about three quarters of the seasoning mixture evenly over the chicken pieces. Sprinkle the cranberries over the top. 4. Cook the chicken for 45 minutes to an hour, until it is cooked through. Turn the chicken pieces, and sprinkle with the remaining seasoning mixture. Add the remaining ¼ cup of orange juice to the pan. Return the chicken to the oven, and cook for another 15 minutes. 5. Note: This dish freezes well. Wrap individual chicken pieces in foil to freeze. To use, thaw them overnight in the refrigerator and reheat.